The long nightmare isn’t over. I still don’t have a new front tooth. Yesterday, I went to the dentist thinking it was time to get me a fancy permanent fake toof attached to the implant that was put in my upper jaw. But no. Instead, I started a multi-step process of fittings that rivals buying a wedding gown. As far too many people know, I lost a tooth (yeah, one of my top front ones) more than seven months ago, leaving a gaping hole in my head. I was given a small prosthetic device to trick people into believing I had all of my teeth while the required bone graft healed. The lone denture is sort of like torture and drives me insane. So I spend most of my time toothless. For all of these months, I’ve had the fake tooth in my mouth only when I’ve just had to, and I’ve probably kept it out when it really should have been in there. It was a neat bit of karma and coincidence that I keynoted the Texas Dental Hygienists’ Association dinner on Sunday night. They had their lobby day at the Capitol yesterday. I showed my solidarity with them by giving my speech with my fake dental device in place. I figured they too often get to see the horror created by the absence of a full set of incisors. It’s not fair to add to the trauma of meeting with members of the legislature. I got to take part in a nice event last week. Representative Elliott Naishtat and I had a press conference at Caritas of Austin (a support center for the homeless) to unveil legislation we’re carrying that could make a real difference helping folks get back on their feet. It’s called the Pathways to Employment Act. It would provide a free state-issued photo ID to those who apply for one and have an affidavit to verify that they’re homeless. Getting an ID is often the first step for someone who needs a job – obviously, it’s real tough to find steady work without an ID, and it’s often just as hard to scrape the money together for that ID for those who are homeless. So this bill would help folks take that first step, helping them become self-sufficient while saving money for governments and the community in the process. It’s common-sense for anyone of any party or philosophy. Last week, Representative Naishtat and I walked the media through the bill and what it does. 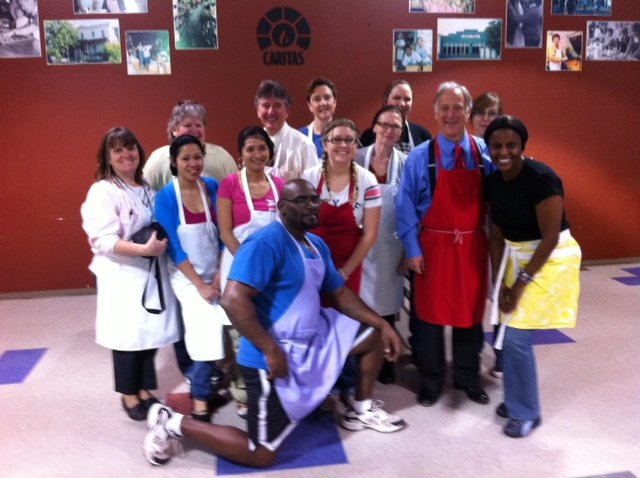 Then we helped the Caritas folks, including some dedicated volunteers, get lunch ready for their clients. It was great to work with these community heroes who are doing so much to take care of their neighbors – and ours. This bill offers one small way for the state to help them out, too. The truth is that addressing homelessness in a meaningful way has been a priority of mine since I was Mayor of Austin. I talked about this a little bit in a speech last year. I remember, during that first mayoral campaign, talking about homelessness with folks who were working on it and realizing how complex an issue it is and how much I needed to learn about it. Then, after I took office, I was struck almost immediately by two things: the severity of the homeless problem in Austin, and the really shocking inability of so many people to address it. I was amazed, and I remain amazed, at how many folks approached the issue as if we had to choose between taking care of our city – as some people defined the city – or taking care of the homeless. I’m still proud of the work we did on the homeless issue when I was mayor. We built the Austin Resource Center for the Homeless. We empowered and formed lasting partnerships with non-profits and faith-based groups. And we beat back efforts to move the homeless to some part of the region where they wouldn’t be seen – and where the difficult questions raised by their homelessness wouldn’t seem so immediate. But still, if you ask me to name the one area I was most frustrated by when I was mayor – the part of city government that kept me up at night knowing I wasn’t achieving what I wanted, or that I just stayed upset about – it was this one. The numbers show how much work there is to do. According to the group Green Doors last year, there were more than 5,000 homeless people on any given night in Austin and Travis County, 616 homeless families with children, and 3,000 to 5,000 homeless AISD students. The state can do more to help those in Central Texas and across this state who are doing so much to address this issue. The Pathways to Employment Act is just one small step, but a very good one.